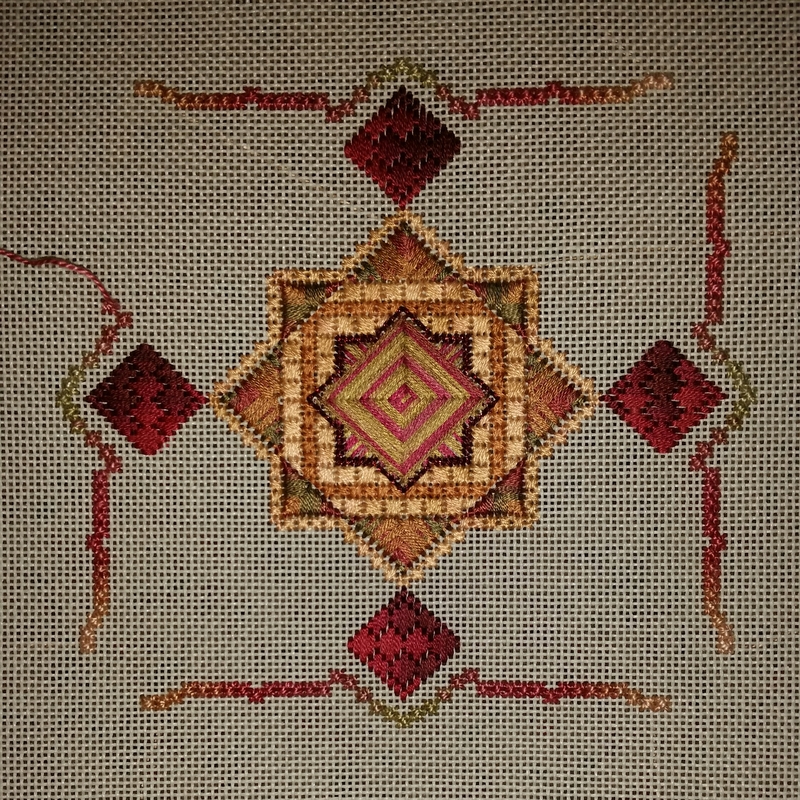 Because we have the ANG CyberPointers meeting over Labor Day weekend & because I am anxious to get back to stitching Spirit of Jean, I am dedicating what stitching time I have this weekend to this piece. After reading the meeting reports Saturday morning, I finished the 4 diamond pavilions. Then, we enjoyed the afternoon at the Arden Fair & killer Golden Margaritas over dinner with our Delaware friends! The members leading CPs certainly do a fine job. And, this is one of the Correspondence Courses they voted to do as a group. Sunday morning I worked on the Smyrna stitches. I got to this point and realized that I had missed the inner ring of Smyrnas. So, I ripped & started restitching it Sunday. And, Monday, I got back to where I was! I’m glad I had to redo it. I didn’t have enough of the thread for the diamond pavilions. So, I found a better match in my stash! And, I rethought my upcoming planned thread placement & made a couple of changes. The over dyed Watercolours was from Mae’s stash & the length was fantastic to match the pattern symmetrically. 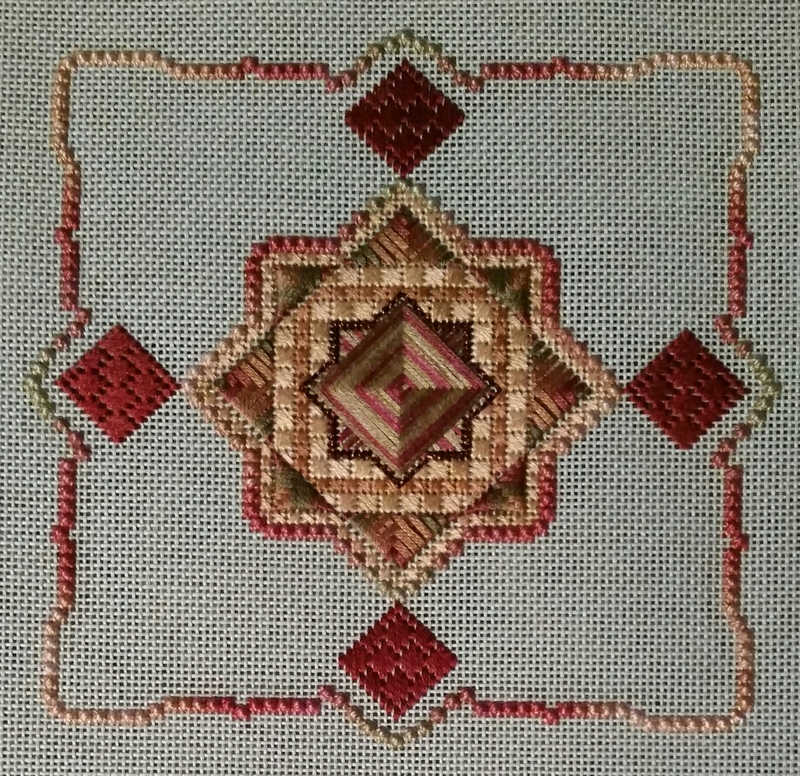 I found the center green & stitched outwards to all sides. I’m very happy! Great weekend with friends & for stitching! I love how jeans patterns have rows of smyrna stitches making waves. They do add a nice effect. She used them quite a bit & I can see why.